Reservations are necessary and are secured by a deposit for a specific date. We hold a drivers license as a security deposit until equipment is returned. (Or a sizeable deposit may be placed on a charge card.) Payment for Rentals is due. Renters are responsible for any damaged/lost equipment and must sign a lost equipment agreement and a liability release. We supply all paddles, PFD's, Car Top Carriers, Tie down Ropes, Etc. There is a $5 Fee for boats or PFD's returned MUDDY. Cancellations accepted up to 24 hours before. At Oak Orchard's Waterport location, we rent six days a week. Both require Reservations and Boat Pick Up Times are necessary for Do It Yourself or with Shuttle - Call! Choose from CANOES (holds two people) or KAYAKS (one and two). Parents with children under 10 years of age, we offer Canoes (holds up to 2 adults and 2 kids) and Kayaks (solo & tandem) bridge 4 thru 6 on flatwater (Lake Alice). 1. Do-it-Yourself - $39.90 +tax, (per craft). 2. The River Trip - $89.90 +tax, (per craft). 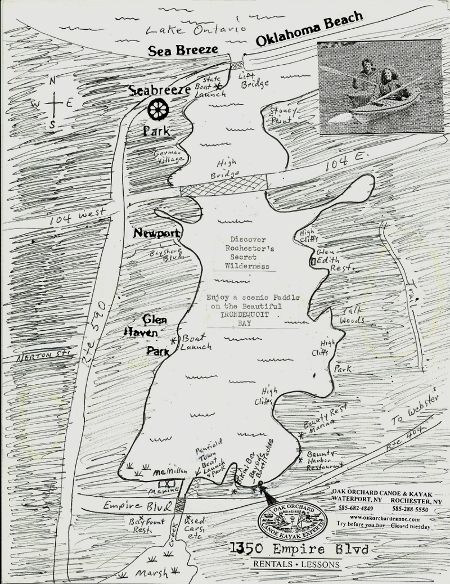 see map of Oak Orchard River - click here! Just a note to say how much I appreciated your kindness on both of our kayaking trips last week. We loved the river and all the wildlife we saw along the way. We also appreciated the great equipment, shuttle, map and most of all - you. You make Oak Orchard Canoe my favorite destination. Oak Orchard Creek River Trip Requirements! 1. Please, no participants under 10 years of age for River Trip bridges 1 thru 4 (see map). 2. Scheduled trips with deposits shall proceed if light rain is forecast - but NO trip shall proceed if lightning/thunder or high water levels are noted! 5. No age restrictions are necessary for the Lake Alice flatwater portion of the trip (bridges 4 thru 6). What better way to spend an afternoon than canoeing or kayaking the many waterways of Orleans County? Explore the several streams, all summer long, that run within Orleans. Most have good flow levels throughout the year and let's not forget the remarkable NYS Erie Barge Canal. We have Do-It-Yourself rentals or call to arrange rental with shuttle service. We can drop your vehicle at bridge 4 or at bridge six (see map). Probably the best known stream for self-propelled craft is the beautiful, sparkling waters of the Oak Orchard River, a popular site for thousands of Western New Yorkers and indeed travelers from other states and Ontario. A small car-topped boat, a paddle and a Coast Guard approved PFD (personal floatation device) are all you need to get started. The river is free, no licensing necessary on these small craft. Put-ins and take-outs are free, although limited. With a map of the area, one can find the most popular launching site at the bridge on Slade Road at Route 63 two miles north of Medina. Other carry-ins include the bridges of Horan Road and Bates Road. A small take-out is also located at the southwest corner of the Route 104 bridge at Culvert Road. The end of the float trip, on the moving water, is the Yates-Carlton Townline Knowlesville Road, about three miles north of Route 104. There is lots of parking for shuttle vehicles. If you should decide to paddle all the way to the 6th and last bridge at Waterport, this means no more moving or current waters. Definitely more difficult paddling! But if you're not in a hurry you can pull out at our dock in Waterport where your car can be waiting for you. Whew! You've been on the water now approximately 3½ to 4½ hrs. While most property owners adjacent to put-ins and river fronts are friendly to paddlers, others object strongly! So be ever respectful to any posted signs. We paddlers have a saying in this sport of canoeing and kayaking - "Leave no trace" and "If you must leave something, leave only ripples." This means that we carry out that which we have brought in. Recommended ages for the novice paddlers on this river is 10 years of age and older. Skill levels aren't demanding but common sense should be very keen to spot fallen trees (called strainers) impeding your path and to be wary of high water levels after heavy rains. Never ever paddle alone and always wear a PFD. A change of clothes is always a good idea should you "dump." It's very important to have good water shoes to protect against sharp zebra mussel casings and other sharp objects on the river bottom. Most of the river bottom is sandy/gravel with stretches of smooth shale rock. Paddling downstream, the larger rocks are easily found while some are just below the surface indicated by a "V" or turbulence. Avoid these, because of the sudden stop or hitting some just to be spun around backwards. Low branches abound! So always duck forward and never to the side. Two paddlers leaning to the same side will cause an upset boat. Also, leave word with friends where you are going and when you should return. Rentals are available, as is instruction and lessons. The cost to purchase your own craft will run $300 to $3,000. Car-top racks to safely carry small boats and other items are a wise investment. We install most Yakima and Thule racks purchased here at no additional charge. Check Oak Orchard's own line of car-topping accessories. J-Cradles (carry kayaks on their sides to save space), our Gull Wing Kayak Saddle (that won't dent your hull like others) and our unbelievably simple SUV Kayak Roller Loaders (drops into the roof top crack of most rear lift doors). All will improve the ease of loading and unloading your boats. And unlike the box stores, we won't just walk you and your selection as far as the cash register - you're on your own from there. We are a full service specialty paddle shop since 1974. Large or small groups welcome by appointment. Both - Canoe & Kayak Rentals available!!! What better way to spend a half day than on the sparkling clean waters of the Oak Orchard River? Float Trips can be arranged for the adventurous or the entire family. We supply everything except your lunch! "The Oak Orchard River is one of New York's finest for Canoeing or Kayaking." Rentals are due back 15 minutes prior to closing. Late returns will be subject to a $40 late fee. Rental Do-it-Yourself ...........$39.95 Shuttle to Lake Alice add $10 per craft. (with rentals paid). (boats must be returned at close of business or at 10am the next morning) or (pick up your rental the evening before one hour before closing at no extra charge) - Drivers License held as Deposit. Bridges 1 thru 6; ...two people per canoe. Bridges 1 thru 4; ...Add $25. to have your rental be picked up at bridge 4. [You will leave your car at bridge 4 - end of moving waters!] 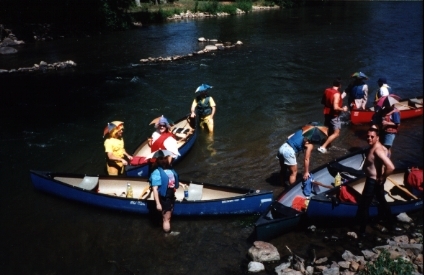 (flat fee divided by # of canoes in your group) We pick them up there... You drive home from bridge 4. 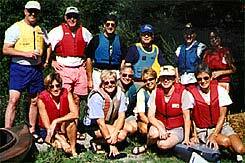 Click here for Oak Orchard River Trip requirements. ONE person Kayak RentalDo-It-Yourself...$29.95 for one kayak, per day + tax; (per craft). TWO Person Kayak Rental Do-It-yourself... $39.95 per tandem kayak, per day + tax. Shuttle to Lake Alice add $10 per craft. Bridges 1 thru 4; ...Add $25. to have your rental be picked up at bridge 4. [You will leave your car at bridge 4 - end of moving waters!] (flat fee divided by # of kayaks in your group) We pick them up there... You drive home from bridge 4. Rental Do-it-Yourself ...........$39.95 per Day. Shuttle to Lake Alice add $10 per craft. (boards must be returned at close of business or at 10am the next morning) or (pick up your rental the evening before one hour before closing at no extra charge) - Drivers License held as Deposit. Weekend Rental (Do-it-Yourself -PaddleBoard, Canoe or Kayak) $89.90 +tax (per craft). Security deposit on your charge card until all equipment and boats are returned in due time and good condition. Deposit amount is based on retail value of equipment you rent. by Paddle Board, Canoe or Kayak." Charge Card "Deposit" for value of gear rented is Required. - OR... Leave a Driver's License or registration as a deposit until all equipment is returned. Hourly Rentals are First come First Served. Sorry, No reservations for hourly rentals. We do not send out new hourly rentals within one hour of closing. Rentals are due back 15 minute prior to closing. Late returns will be subject to a $40 late fee. Daily Rental Rates; ON Premises; Launch from our dock. Note: Flat fee of $19. for a rental of less than 60 minutes! Take your Rental to the Destination of your Choice. Thinking of purchasing a particular canoe or kayak??? We have dozens of specific models for you to choose from. Rent several and buy your favorite ! Need Lessons for Paddle Boards, Canoeing or Kayaking ??? Just give us a call, we can set up an appointment for your private lesson or a group lesson. We'll cover all the basics so you can get out on the water safely and easily. Boats, Paddles and Pfd's are provided unless you already have your own. ........Lesson dates and times are set by appointment only. All lessons off our own private docks - Get started Today! Come with us and enjoy nature's beauty!